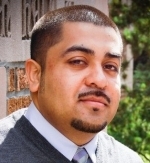 Eligio Martinez Jr. is a doctoral student at the University of Washington, College of Education. He received his Bachelor of Arts in History and Chicana and Chicano Studies from the University of California, Los Angeles and a Master in Education from the University of Washington. Eligio specializes in Higher Education Policy, in particular on issues of access into higher education for students of color. His main area of research focuses on the role that military programs in high schools play in impacting post-graduation plans for high school students.